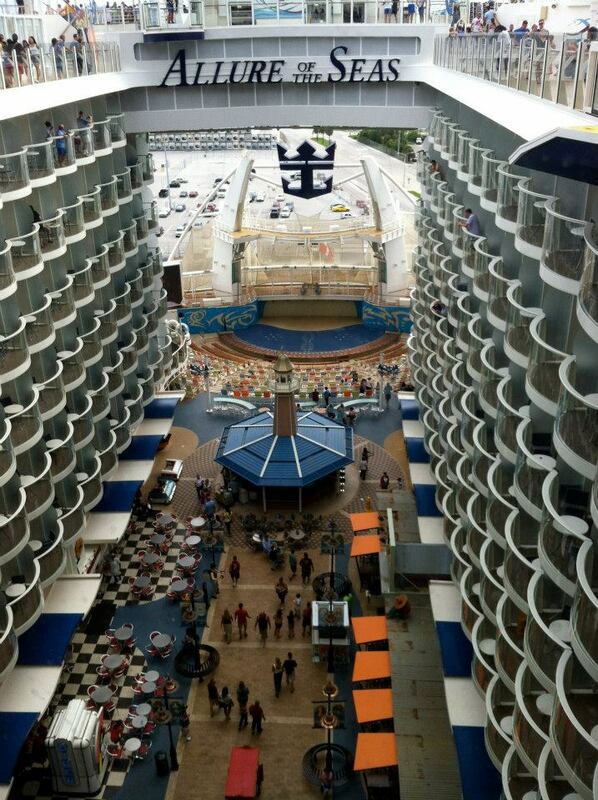 October 7, 6062 passengers and I, as well as 2500 crew spent a week on Royal Caribbean’s Allure of the Seas. 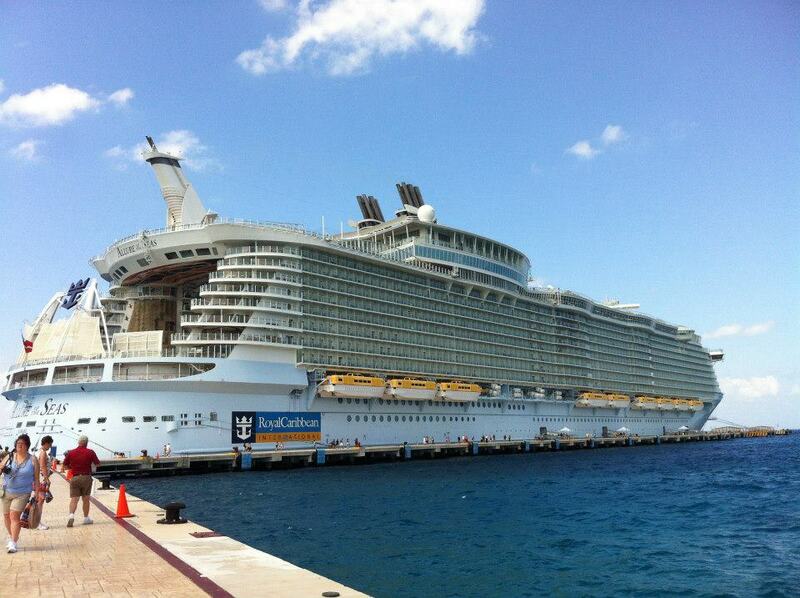 Currently the largest ship on the ocean (it is 50mm longer than her twin, Oasis). This was my 2nd cruise, both with Royal Caribbean (I sailed on the Freedom of the Seas for Thanksgiving 2010). I will start by saying that it was a fantastic trip. We all had a great time and there were very few mishaps and/or problems that we encountered. That being said, I will probably not sail on a mega ship again. For me it was too big, I was on constant sensory overload and I always felt like we were missing out on something. A little background on the players involved on this trip. There was me (clearly), my two boys (14 and 10 years old), my father (73), my mother (69) and step-father (75), my brother and his partner and their daughter (11mos.). Yes, my mother, father and step-father all travel together. We also have family dinners every week and spend all holidays together. It makes me happy that it works so well between them all. So we are all flying into Ft. Lauderdale the day before the cruise and staying at the Embassy Suites on 17th Street They had a cruise package that included transportation from the airport to the hotel and then from the hotel to the cruise terminal the next morning. If I had known how close it all was, I would have just booked the room and made other arrangements for transportation, but live and learn! The flight was thankfully uneventful and we landed it Florida with no incident. We walked out of the terminal and promptly melted. Now I live in the South, so I am used to a certain amount of heat, but it was HOT! We called the hotel to alert them that we were here and they sent a blissfully air conditioned car for us. After getting our rooms organized (6 people, three beds, two rooms) we moved on to the next important decision in our life…dinner. The hotel offers a “Manager’s Reception” which includes free cocktails and hors d’oeuvres. I had to put that in italics because what they actually served was potato chips, pretzels, dip and pita chips with hummus. Please don’t think that I am complaining, free is free. But lets call a spade a spade, those are snacks, not hors d’oeuvres. On the other hand, the beverages available were beer, wine and rail drinks. Perfectly satisfactory in my mind! I am sure that the restaurant in the hotel was very good, but at $16 for a burger and fries, it was not where we chose to eat. We chose every travelers standby dinner…Outback. The Outback is within walking distance and on a Saturday night at 6:30pm there was no wait. Also within walking distance is a Publix (grocery store) for any last minute items that may have been forgotten. There is also a Total Wine but Royal Caribbean does not allow passengers to bring alcohol on board the ship…not that I was worried, there is always plenty to drink on a cruise ship! We were sailing the Western itinerary which included stops at Labadee, Haiti (Royal’s private island), Falmouth, Jamaica and Cozumel, Mexico with three days at sea as well. I enjoyed Royal’s island on the Eastern route (Coco Cay, Bahamas) so I was looking forward to the private island on this trip as well. The check-in/boarding procedures at Terminal 18 in Ft. Lauderdale are easy-peasy. The terminal even has a little playground for kids so you don’t have to hear your 10-year old ask you four thousand times “How much longer?” Stepping onto the Allure of the Seas is nearly overwhelming. It really is a floating city. A Starbucks, a boardwalk complete with a merry-go-round, a shopping mall with stores such as Coach, Guess, Prince & Greene, etc., a lush green park with winding walkways and benches for relaxing and more restaurants and bars than one could hope to hit in such a short time. The ship advertises 25 dining options…on a 7 night cruise, you are on board for 21 meals (at a standard 3 squares a day formula.) Not all of these are included in your cruise fare, but certainly enough to be sure that no one will starve! The boardwalk is a new concept on cruise ships. We decided to get boardwalk balcony cabins since this feature is only available on the Allure and her sister, Oasis. We were on Deck 12 and we had a great view of the shows in the Aqua Theater as well as the wake off the back. As per the norm on sailaway, the upstairs buffet was packed! Trying to find a table for 9 including one wheelchair and one stroller was nothing short of a miracle, but we did find one and settled down to eat. The buffet was as expected, something for everyone, nothing really outstanding but no one went hungry! After everyone was eating and relatively happy, I went to wander around and take some pictures. I also needed to make sure our entire party were going to be seated together in the dining room, so a quick trip down to deck 4 was in order as well. Previous postEven Here I Have to Cook for You…the Finale! Next postI Voted…Now I’m Leaving the Country!